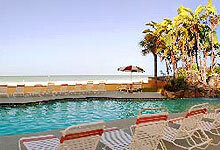 We list and link EVERY lodging provider in St. Pete Beach that we know of. Like this page ?? 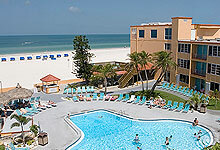 Visit Beachdirectory.Com for even more detailed information about St. Pete Beach. The Bay Palm Resort is a pet-friendly hotel located directly on the intracoastal waterway across from the beach, overlooking the serene waters of the bay. We have a 1,200 square-foot fishing and boat dock for guest use, sundeck, and pool. Where the white sandy beach meets the Gulf of Mexico, you'll find a place which harkens back to the days when much of Florida offered vacationers colorful art deco style motels. Still all pink, Beach Haven retains its charming and distinctive personality while providing beautifully updated interiors and furnishings. Conveniently located on Gulf Boulevard, St.Pete Beach, Beach Haven is close to great shopping, dining, and entertainment. Perfect for extended stays, smaller groups, and families, each one-bedroom suite provides separate living room, washers and dryers and a fully equipped kitchen with refrigerator, ice maker, coffee maker, microwave, and range. And special details such as spectacular views of the Gulf of Mexico, private balconies, and poolside service, add the extra touch. Relax in our gracious accommodations featuring resort-style amenities. Our beautifully-decorated guest rooms include all the amenities you would expect from a beachfront resort. We are located directly on the beach - watch the dolphins play from your window! We provide outstanding rental accommodations, breathtaking sunsets, two spacious heated swimming pools, laundry facilities, and Sandbar Bills Bar and Grille, the best lounge on the beach, where the locals gather. 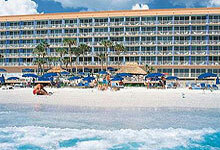 Just across from the beach where the white sands and pristine Gulf of Mexico meet. Strolling along the white beaches in the morning and evening you will see many of the most amazing views in this quaint part of Florida. Florida vacation rentals - that's what we know best, that's what we do best! Each year Capalbo Rental and Management makes dreams come true for tens of thousands of guests whose plans call for travel to Florida and our Gulf of Mexico beaches. Short-term, fully furnished Florida vacation condo rentals along Florida's central Gulf coast are offered in all of our privately-owned resort condos. Directly on beach - 360 deg. panorama on our site! 173 rooms on 400 feet of beautiful beachfront ! Rooms in various categories to fit your vacationing needs. Each room features two double beds, FREE movie channels, a refrigerator, microwave and hairdryer. Meeting and banquet facilities available! Cribs are available upon request at no additional charge. LARGE heated beachfront pool, must see picture ! Known as Florida's legendary Pink Palace, the luxury resort is revered internationally for its sprawling, sugar-white beach, unparalleled dining, rejuvenating Beach Club & Spa, fabulous fishing, children's program, nearby tennis and golf and award-winning meeting facilities. Let us pamper you today! Tropical Paradise Resort Directly on the Beach! Reserve your spot on the sand now at the Doubletree Beach Resort! 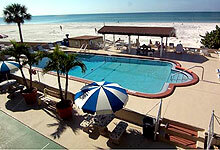 Centrally located between Clearwater and St. Pete Beach, directly on the Beach and Gulf of Mexico. 125 Spacious NEW Guestrooms with Private Furnished Balcony. Private Beach and Beachfront Pool. Mangos Restaurant with open air gulffront Verandah and Beachside Tiki Bar featuring Live Entertainment. Friendly, Fun Hospitality and Warm Chocolate Chip Cookies! Kenneth and Margaret Herman invite you to visit Pass-a-Grille Beach for a perfect vacation in Paradise. Come enjoy our beach, sail our tranquil waters, pursue excursions to numerous day trip destinations, or sit back, relax, and watch the sunrise and sunset. Come stay with us and enjoy low rates on our clean and comfortable efficiency or one-bedroom motel apartments. 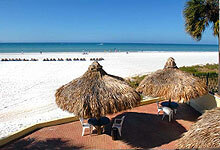 Just steps from the beautiful, white sands and dolphin-filled waters of St. Pete Beach on the Gulf of Mexico. 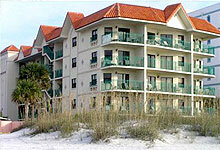 At the Gulf Beach Resort, our lovely one-bedroom Florida condo rentals are either Gulf-front or Gulf-view. They sleep up to 4 adults comfortably and are fully equipped with a full kitchen and 2 cable TVs with HBO. There is even a laundry room on the premises if you should feel the need to get caught up on the laundry. This 40-unit luxury resort offers one bedroom, one and a half bath or two bedroom, two bath units, all exquisitely decorated and fully furnished to suit the tastes of the most discriminating guest. We've spared no expense to make sure your vacation resort has everything you need and more. Each unit comes fully furnished with the quality of decorating you'd expect to find only in your own home. We offer beautiful apartment-sized suites and efficiencies for your comfort during your stay in Florida. Come and enjoy our wonderful amenities, including our large heated pool, free wireless Internet, BBQ grill, laundry facilities, and more. Clean spacious one-bedroom suites and efficiencies. Don't take our word for it, see the many pictures on our website. 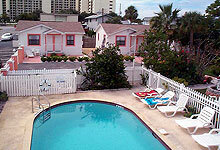 Our property is small, just 10 units, but has a heated pool, barbecue grills, and is located on a quiet street. Nestled right in the midst of everything, yet on the restful side of town. Elegantly decorated rooms for your comfort. 12 unique units with full climate control, modern, fully equipped kitchens, telephone and full service cable television. Casual and understated elegance in a bed and breakfast setting. See pictures on our website and you will see that we are different. An oasis of real peace and quiet where the crystal blue waters of the Gulf of Mexico and the intracoastal waterway surround your very own private hideaway at the southern most tip of historic Pass-A-Grille. 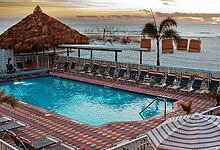 31 units directly on the Gulf of Mexico. We offer 1 & 2 bedroom condominiums, either poolside or with a Gulf View. See floorplans of units on our website. All units have fully equipped kitchens and pull-out sofa beds. 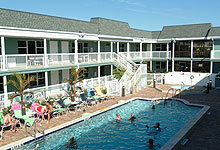 Heated pool, two jacuzzis, barbecue and many other amenities in a beachfront setting sheltered from wind. Directly on the beautiful Gulf of Mexico in St. Pete Beach, Florida. Take a stroll along miles of white sandy beach with rolling surf and spectacular sunsets. We're always happy to speak with you to answer any questions you may have. Our tranquil waterfront Florida resort features seven well appointed suites and two lovely waterfront rooms. Framed by beautiful Boca Ciega Bay on one side and tropical plants, trees and colorful flowers on the other, Pasa Tiempo B&B Resort is full of nature and peace. A perfect destination for a romantic weekend or simply a most relaxing getaway. You will find a perfect spot to cuddle with your sweetheart, watch the birds, wait for the dolphins or simply let time pass. Choose from over 100 beach front condos! 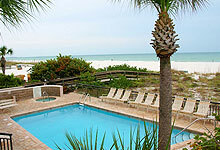 Resort Rentals offers a wide selection of waterfront vacation rentals - condos and private homes. 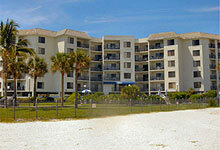 All of our units are conveniently located either directly on the beach or on the bay and are fully equipped. Some of our featured properties are Lands End, Villa Madeira, Arie Dam, Trillium and Sunset II. All of our beautiful private homes are water front pool homes. Pick your favorite location on the West Coast of Florida - St Pete Beach, Treasure Island, Madeira Beach, Redington Shores, Indian Shores. Please check us out on our detailed and easy to navigate website or call us toll free! receive a 15% fall discount !! You'll find yourself relaxing under our breathtaking, magnificent sunsets. Let your stress escape into waves as you walk along our calm, white beaches. You'll find us nestled on the beachfront of historic Pass-A-Grille. The Sirata Beach Resort is a deluxe beachfront hotel. One bedroom king suites offer beach & bayfront views & include individual climate control, a work space w/desk, coffee maker w/coffee/tea, two remote control color TVs w/cable & Pay Per View movies, a fully equipped kitchen, and much, much more! 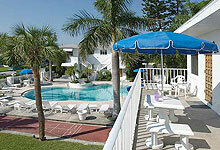 Our motel truly offers the best value during your visit to St. Pete Beach and the St. Petersburg area. It is conveniently located within walking distance to the beach, the bay, markets, shopping centers, churches, and many restaurants. The landmark St. Johns Catholic Church is just across the street. Deluxe and standard suites, completely remodeled in 2007. Choose Gulf or Poolside Views. Large heated pool with large sundeck and shuffleboard courts. The Best Sunsets on the island just 50 yards away at "Sunset Park". Close to beach and many waterfront restaurants. Beautiful bay view and steps to the Gulf - the best of both worlds! Sunrise Resort is a luxury condominium resort overlooking beautiful Boca Ciega Bay and only steps across the street to the sugar-white sands on the Gulf of Mexico, offering the best of both worlds. Enjoy a leisurely breakfast on your private balcony while watching dolphins play in the golden morning sun, while planning how you'll spend your day. Amenities include private tennis courts, heated pool, private fishing dock, gas barbecue grill, whirlpool spa, and large deck for lounging in the sun. 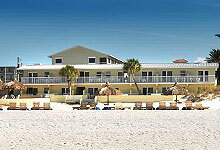 Located directly on the Gulf of Mexico in beautiful St. Pete Beach. We offer a perfect combination of luxury, comfort, value and recreation. Take a refreshing dip in one of our two swimming pools, or rest your weary bones in one of two whirlpool spas. Come to relax ! We also have meeting facilities for up to 50 people. This gulf front luxury condo hotel on St Pete Beach�s beautiful white sands offers panoramic sunsets and relaxed vacation living. 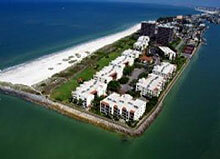 Vistas on the Gulf consists of forty two luxury 2 bedroom, 2 full bath condos that sleep up to 6 people. Each unit has a fully equipped kitchen, washer/dryer and private balcony.